Spring Boot eases creating spring based application. One doesn’t need to depend on XML for configuration. It uses annotations for auto configuration and one can come up with a running application very fast. The first draft of the application, auto-created by the spring boot is opinionated. This is obvious as its main goal is to develop application at a very speedy manner, having said that, one can easily extend it and get out of its initial framework. It allows one to add Spring Boot Starters and dependencies to your application and then generate the project. See spring starter site to build one by yourself. The ideal way would be to go to http://start.spring.io/, click on ‘Switch to Full Version’ and select ‘Web’ as dependency. Enter groupID and artifactID. Click on ‘Generate Project’ to download the project. Extract the downloaded zip file. Import the project as an ‘Existing Maven Project’. For building the project, we can use either Maven or Gradle. In the spring starter page, by default, Maven is selected. We inherit spring provided artifact spring-boot-starter-parent to make use of the Maven defaults. To create an executable jar we need to add the spring-boot-maven-plugin to our pom.xml. Spring Boot is dependent on third party libraries and the spring framework itself. The dependencies are managed by spring boot itself and we should avoid override the versions of these libraries. SpringBootWebMvcApplication is the main class. This is an auto-generated class. In the main method, SpringApplication.run() is called which in turn delegates the control to spring boot’s SpringApplication. 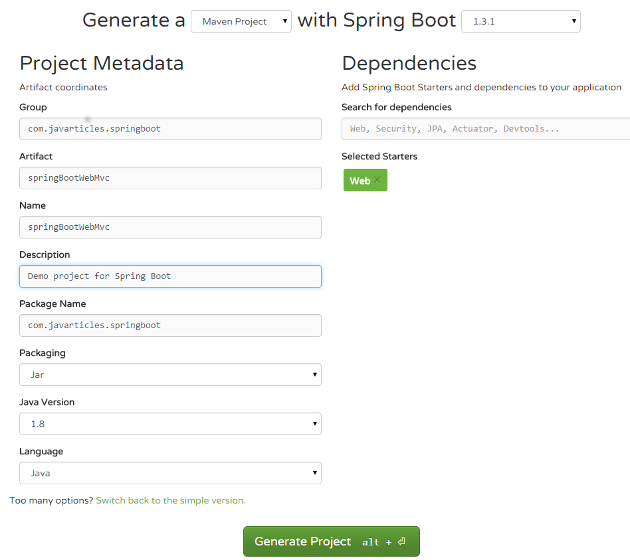 Once spring boot takes charge, SpringApplication will bootstrap our application. Spring will in turn start the embedded auto-configured Tomcat web server. SpringBootWebMvcApplication is passed in as the first argument to SpringApplication.run(). We will modify the main class to add in a request mapping. Annotated the main class with @RestController – this is to mark the class as a web controller and let Spring know that the class is going to handle incoming web requests. Add a request handler – Method sayHello() is marked with @RequestMapping("/sayHello") annotation. When the relative path is “/sayHello”, this method will handle the request. Starts embedded tomcat, listening on 8080. Request mapping /sayHello is mapped to SpringBootWebMvcApplication.sayHello(). This was an example to introduce spring boot.